Calcium Supplements for IBS: Which is Best? It has been estimated that at least 65% of the people suffering from IBS are women. It is also widely known that women are at much higher risk of developing osteoporosis later in life than male counterparts. What’s the connection? One of the key symptoms for people suffering Irritable Bowel Syndrome is diarrhea. When this painful symptom occurs, it depletes the body of not just valuable fluids, but also critical minerals and vitamins, such as calcium. Of the supplements that are on the list of recommended treatments for IBS sufferers, some form of calcium is always going to be on the list, as this crucial mineral is absolutely necessary for bone growth and strength, healthy teeth, optimum nerve function, and muscle function. Since almost all of the body’s calcium is stored in the bones, and it’s not something the body can make on its own, it is important to supplement when there is a deficiency. The body will use any available calcium it can, even if it has to leach it from the bones. This is why it’s so important to get useable calcium in a supplement form if you aren’t jazzed about the idea of eating 100 pounds of broccoli and beans every week. But which is the best form of supplementation? A reader asked once about the difference between calcium citrate and calcium carbonate, and which is the better option. Calcium carbonate is found naturally all over the earth. Common examples of it are limestone, marble, and chalk. It is also found in some chewable and drink-based supplements as well. It is the least expensive form but a lot of people have trouble with it…especially people with a history of kidney stones. This is a problem for IBS sufferers because chronic dehydration puts added stress on the kidneys. This form also requires the consumer to take it with food to avoid a lot of the stomach and intestinal upset issues that accompany it. It also causes constipation and gas. Who needs that? While the positives of the supplement (widely available and cheap) are important to note, it’s also worth noting that if a supplement is hard to digest or causes other problems, it’s not really doing its job. Most of the evidence out there suggests that calcium citrate is the far and away best choice for people, regardless of whether or not they have IBS or any other condition, simply because it is much more easily processed by the body, doesn’t have to be taken with food, and isn’t going to interfere with other medications such as those for GERD. Calcium citrate doesn’t have the same high levels of calcium as calcium carbonate, so you have to end up taking more of it to do the same job. However, the risk of over-supplementing and the side effects of that are much, much less. 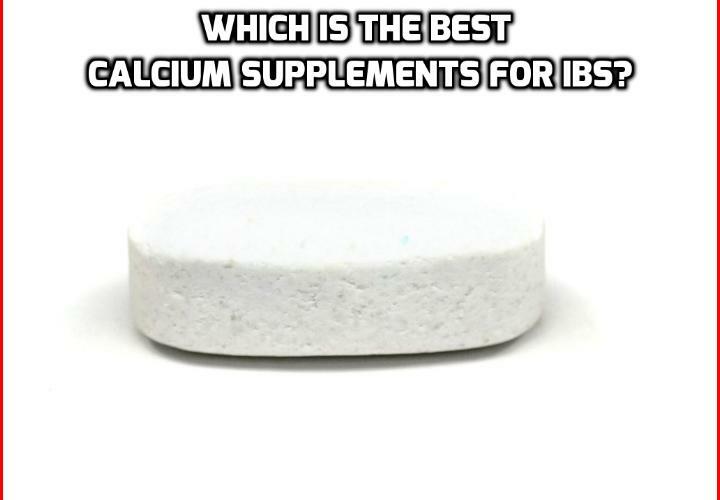 So, it can be considered the best calcium supplements for IBS. While we are not supposed to recommend a particular name brand of calcium supplements for IBS (a licensing issue), I can tell you that calcium citrate is found at most every vitamin aisle in grocery stores, discount department stores, drug stores and certainly health food stores. Finding one you like shouldn’t be hard to do, especially if you already take another supplement from a maker you particularly like. For more information on recommended calcium supplements for IBS sufferers along with a natural, comprehensive plan to resolve IBS in just 3 weeks, see our Treating IBS Naturally guide today. Next PostNext When Is Constipation a Genuine Medical Emergency?